An article title in bold-faced letters reads “EMERGING SOLAR PLANTS SCORCH BIRDS IN MID-AIR”. Appearing on Associated Press , this article , authored by Ellen Knickmeyer and John Locher (2014) , is exemplary of the media’s use of biased sensationalism to slight alternative energy and its effects on bird populations. Whenever possible , popular media tends to highlight examples of charismatic megafauna , or larger organisms with high popular appeal , brutally killed off in cruel and , unusual manners . Whether it be wind turbines decapitating raptors, displaced and dehydrated desert tortoises, or spontaneously combusting “Streamer” birds , these stories serve to aggrandize the farcical evils of alternative energy sources (Knickmeyer and Locher , 2014). What is left out of a large portion of popular media and discourse are the comparative death rates of birds among energy sources . These aforementioned stories , with their inclusion of palpable violence done unto the most emotionally-appealing creatures , mask the long-standing direct and indirect ways in which the fossil fuel industry kills over 14 million birds annually . Infrequently do reports surface documenting the extraction of coal being solely responsible for the death of 7.9 million bird deaths per year (Sovacool , 2013) Rarely discussed are the immediate and downstream effects on avian creatures resulting from the fossil fuel industry ; such as the depletion of viable bird habitat in the form of hundreds of thousands of acres of deciduous forest clear cut annually for coal mining . The combustion of fossil fuels, like coal and oil , is responsible for incredible rates of non-point source pollution which cause detrimental effects on birds that transcend generations; such as the nation wide phenomenon of acid rain , or the bioaccumulation of mercury in birds that lowers their brood sizes and made serious effects on the health of their young(Sovacool 2013). Our paper intends to make a case in defense of wind energy , with regard to its association with having severe negative effects on bird populations . By comparing the number of annual bird deaths attributable to a combination of several energy resources, this essay intends to provide evidence for wind power’s relatively small involvement in bird mortality within the United States ; while simultaneously highlighting how structural modifications to and an increased dependence on wind turbines can reduce said mortality in addition to the average national annual death toll . The Gigawatt hour ,or GWh , is the standard unit of energy used to discuss electricity production at a national scale-level . One GWh is the equivalent to 1,000,000 Kilowatt hours . By looking at this same issue in terms of the number of birds killed per Gigawatt hour generated by the various energy sources(coal and wind) , the comparative ratios serve to portray coal extraction and its’ resulting energy production as the truly destructive industry that it is . In his 2013 Report , The avian benefits of wind energy , Benjamin K. Sovacool assesses the number of bird fatalities associated with various energy sources based on meta-analysis and a collection of results from experiments from across the country . His findings indicate that on average , wind turbines killed .3 to .4 birds per GWh of electricity they produced , while coal killed approximately 5.2 bird per GWh (Sovacool 2013) . Standing alone , these numbers are indicative of the marked increase in harm done unto bird populations posed by coal . What is more telling , is that by using these determined multipliers (.35 for wind energy and 5.2 for coal) , in addition to a hypothetical inflation of wind energy’s contribution toward the national electricity production , it is evident that even despite this inflation , coal would still kill more birds annually . According to the U.S. Energy Information Administration , Coal accounts for approximately 33% of our nation’s electricity production (2015). As a nation the United States produces a total of 4 million GWh per year , meaning that coal accounts for 1,333,333.33 of those gigawatt-hours . In contrast , wind energy contributes much less , at 4.7 % , or 188,000 GWh annually (US EIA , 2015) . Disregarding the latent effects of coal extraction that also account for bird fatality such as acid rain , bioaccumulation of mercury and habitat loss , this would conservatively determine that coal causes 6,933,333.22 , or approximately 7 million bird fatalities annually . In comparison , multiplying the 188,000 GWh produced by wind turbines , by Sovacool’s averaged experimental ratio of .35 birds per GWh , equals to 65,800 bird fatalities per year . Note that these are both conservative , and hypothetical calculations . 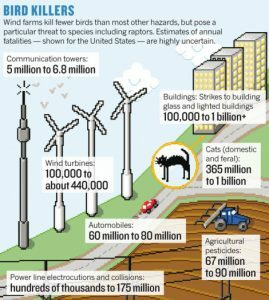 In reality , the number of bird fatalities attributable to wind energy is approximately 350,000 (Loss et al ., 2013 ; Sovacool, 2013;Wang & Wang , 2015) . Hypothetically , if our nation saw a significant increase such as a 50% dependency on wind energy , the total number of birds killed on an annual basis would still be less than that of coal . The national generation electricity is currently 4 million GWh . If wind turbines were to account for 2 million GWh produced annually , multiplied by Sovacool’s factor of .35 , this equates to 700,000 bird fatalities annually . For argument sake , even despite adding the current number of bird fatalities attributable to wind energy to this hypothetical calculation , approximately 350,000 , it still remains less than those attributable to coal , at 1,050,000 bird fatalities per year (Loss et al ., 2013 ; Sovacool, 2013;Wang & Wang , 2015) . Wind farms across the U.S. show a rather insignificant impact on bird populations, but researchers tested and implemented proven methods of altering wind turbines to make them even less hazardous to birds populations. It can be difficult to see the impact wind turbines pose on endangered bird species due to the fact they do not kill any bird species in particular, but by reducing the overall mortality rate of bird species caused by wind turbines through altering the turbines, other benefits, such as the endangered bird species mortality rate, will decrease accordingly. The numbers of avian mortality due to wind turbines are much lower compared to other avian mortality contributors such as feral cats and power lines that serve more than triple the risk (Wang & Wang , 2015), although some people may worry about the turbines critically affecting endangered bird species whose populations are already at risk and low in quantity. Only 214,000- 368,000 birds are killed by turbines each year in the U.S. (Erickson et al. ), compared to the 10-20 billion that currently reside in the US, leaving approximating 99.64% of the bird population unaffected by wind turbines. Wind turbines are a modern source of sustainable energy- efficient electricity, that pose very little threat to the environment in general. Therefore, we should continue to move forward with implementing wind turbines, and instead work to cut down avian mortality by implementing new turbine standards that would substantially reduce death. Wind turbine facilities can increase the diameter of the blades,which birds can see clearly and avoid. Khan (2014) notes that birds, like wind turbines, are more often favorably positioned near high winds to allow for less energy expensive flying and migration, which poses a threat since birds are drawn to these wind turbine locations.Wind turbine facilities could raise the height of the wind turbine itself, where birds may not commonly fly at and away from foraging nests (Khan, 2014). Wind turbine areas could prove to help collect data for bird species residing in that current area, which could help them determine whether this is an area heavily populated by birds, including endangered species. In this case, wind turbines should move elsewhere if a high number of birds occupy in that given location. We can reduce the amount of avian mortality by reducing cut-in speeds, the minimum speed at which the rotor blades turning will produce a certain amount of usable power, by 66% percent, which only lowers the efficiency of the wind turbines by a 3% loss in production (Horn et al. 2008.) The loss in production compared to the speed reduced is highly insignificant, and worth it if it means dramatically reducing avian mortality to an even smaller amount. Wind turbines are usually painted in a neutral white, a non-obtrusive color, making them more inconspicuous than noticeably obvious bright colors. Although these wind turbines may blend in so well against the sky, many birds who lack well defined eyesight, do not see them and collide with the blades upon direct impact. Birds have a fourth set of cone cells, a type of receptor for color, that is particularly sensitive to ultraviolet light. Many of their prey’s bodies naturally reflect UV light making them more detectable, and is highly innate skill for birds to pick up on UV light. Therefore, the suggestion is that we paint wind turbines in bright colors, and add a large ultraviolet lights facing upwind. The effect of these altercations to wind turbines serve to be similarly based upon applying Pavlov’s theory. A dog salivates upon solely hearing a bell alone after numerous occasions when it was time to eat a bell rang at the same time as well, and the same theory can be applied to birds. A loud sound can be applied to the wind turbine, which will emit a noise for birds to stay away when they get too close, similar to a motion detector. The birds may become extremely startled the first time the sound goes off, but the bird, along with its fellow peers, will learn to avoid these areas with wind turbines over time after repetition, like the dinner bell. Hence, it is possible that with time, the number of birds fatalities at a given wind turbine location will decrease due to the repetitive teaching of where the wind turbines are exactly located, solely due to a sound being emitted. As our environment becomes increasingly polluted by huge fossil fuel burning power emissions, there is a greater need for greener solutions for energy production. Coal is one of the largest polluters and causes the deaths of over 7,900,000 birds every year through polluted air, habitats and food sources. As an extreme polluter, releasing over 200 pounds of CO2 into the atmosphere per kiloWatt hour of energy, it is also one of the more expensive energy alternatives costing $297-$332 per MegaWatt Hour. This is over ten times the cost of wind turbines which cost $31-$81 per MegaWatt Hour. Along with being a cheaper energy source than most alternatives including coal wind turbines show zero carbon emissions and no negative pollutants associated with the collection of energy. Wind Energy also provides a safer alternative than nuclear power in that it does not involve the use of radioactive isotopes. Which also allows for the land to repurposed for other uses if they are no longer needed. Large predatory birds like eagles and hawks, have been studied in regard to their susceptibility to being killed by wind turbines. A study was conducted by Johnston, Bradley, and Otter (2014) that directly looked at how frequently Golden Eagles were able to adjust their flight altitudes in order to miss collision with wind turbines. This study specifically looked at how frequently golden eagles flew through areas containing wind turbines, which the authors refer to as the “risk zone” (Johnston et al., 2014, p. 5). By combining and comparing their observations of the numbers in past to more recent years, the authors were able to determine that there are a growing number of golden eagles in the population in which the study took place. The data specifically showed a gradual increase of golden eagles over the years with 327 eagles in 2009 , 380 in 2010 , and 427 in 2011. (Johnston et al., 2014,p.5). This data directly supports the idea that wind turbines are not decimating large predatory birds at a faster rate than they are able to reproduce. The study by Johnston et al. (2014) also shows important information that the golden eagles were able to detect the presence of wind turbines and successfully avoid them. The authors assess the frequencies at which golden eagles would pass through areas containing wind turbines, and determined that before after construction of wind turbines, less than 1% of recorded golden eagles flights flew in the areas of the study low enough to potentially collide with a wind turbine. (Johnston et al., 2014,p.5). Another similar study was conducted in the U.S. specific to golden eagles and wind turbine collision frequencies. “Landscapes for energy and wildlife”, by Tack and Fedy assess the distances of golden eagle nesting areas and their proximity to wind turbines, where they tried to determine a correlation between them. The observations of the authors showed no correlation between nesting distance to collision with wind turbines (Tach & Fedy, 2015, p.6). This supports the idea that golden eagles are able to detect wind turbines and make decisions regarding how to avoid them. This is evidence that larger birds of prey and capable of avoiding wind turbines intentionally and will also be able to teach their offspring how to avoid collision. In regard to larger waterfowl and wind turbines, such as swans, a case study in Denmark was conducted by Jesper Kyed Larsen and Preben Clausen in 2001. The authors observed swans taking off and landing near coastal areas with about 50 wind turbines present at all 4 locations. The authors after the study were able to conclude that the swans were capable of completely avoiding the wind turbines during the day, at sunrise and sunset (Larsen & Clausen 2001, p.397). They agree that wind turbines were not hard for the birds to avoid in lighter conditions, “It seems likely that Whooper Swans will be fully capable of avoiding wind turbines during daylight and good visibility”, Larsen and Clausen (2001, p. 398). Larsen and Clausen (2001) agreed that this swan population’s risk of collision with wind turbines was highest during the morning and evening flights. This points to a very small time frame for collision risks, when light conditions are not optimal, but not dark enough for the birds to completely miss. This small time frame of collision, plus adequate light conditions is evidence that only a small number of swans will collide with wind turbines (Larsen & Clausen, 2001, p. 329). The authors also provide strong evidence that using taller wind turbines can further reduce the risk of collision. They support this argument by showing from their observations, that the average flight height of swans is about 11-20 meters high. They measured the wind turbines in the study zone and found that the tallest wind turbines lowest blade rotation point was 40 meters above the ground (Larsen & Clausen 2001, p. 329, Figure 2.). This is double the average flight height showing that swans are not likely to fly at heights high enough to collide with wind turbines. This evidence supports the points that wind turbines only pose a threat to swans for a very small time frame, and are generally tall enough that swans wouldn’t normally collide with them anyway. Larsen and Clausen in their research did not consider or test the benefits of using lights on wind turbines. The addition of lights to wind turbines would provide the birds extra visibility of wind turbines if light conditions for flying were not optimal. Since the collision rate is already very low for larger swan species, the addition of lights would help reduce wind turbine induced swan deaths further. There are much more harmful things to the bird population than the small number of deaths caused by collision with wind turbines. Overall, through installing more wind turbines in the U.S., green energy will greatly reduce fossil fuel use and benefit the environment by declining the negative effects fossil fuels pose to both the environment collectively as a whole and the animals within it. By implementing more wind turbines that are altered for birds, green energy will lower our dependency on fossil fuel use, and reduce the fatalities caused by fossil fuel pollution. Studies show various methods that can easily be applied for reducing wind turbine induced avian mortality further. Some of these techniques include reducing the speed of the blades, addition of colors and sound, and improving the overall structural heights and widths of each component of the wind turbine. Adding lights is a simple measure that if used correctly can deter birds away from wind turbines. Birds are extremely receptive to UV light in particular. Small UV lights can be attached to wind turbines that would notify birds of the turbines location so that they could be avoided. Wind turbines actually pose as a safer energy alternative for birds than conventional methods such as coal. Coal ash fly is the remaining waste product after coal is burned for energy. The deposition sites of coal ash fly prove to make highly toxic areas that (unlike wind turbines), affect all birds in that habitat (Chernick et al.,2016). The coal fly ash areas will leach excessive amounts of selenium into the soil and can induce many developmental growth deformities that lead to fatalities in all surrounding bird populations Chernick et al.,2016 page 188). Wind turbines only show to have an affect on a very small number of birds in the areas they are implemented, whereas the coal fly ash deposition sites are shown to have toxic effects on almost every neighboring inhabitat (Chernick et al., 2016 page 189). Wind turbines also only cause mortality to individual animals while selenium toxicity can cause issues to bird over generations. The selenium can genetically alter birds, cause them to have underdeveloped bodies, organs, and fatal conditions that can be genetically passed down to offspring (Chernick et al., 2016 page 190).Wind turbines do not pose any genetic mutations to bird populations and effect less birds, making them the safer option than using non-renewable resources like coal. In reducing the number of birds that die from wind turbines, our group decided that all current and future wind turbines need modification with the mentioned alterations. These modifications are mandatory for all wind turbine industries and enforced by the EPA. Implementing laws regarding the alterations for all wind turbines would need to pass for every state in the U.S. and would also require every wind turbine company to go through them to continue building or collecting wind. Through making all wind turbine companies go through the EPA, this would also help to regulate the current wind turbine industry and help researchers to collect better data samples. Through better data sampling, we can continue to improve wind turbines and further lower the amount of bird related deaths substantially more, and the country can continue to progressively move towards an efficient source of green sustainable energy. this image shows the large differences in causes of bird death. Our group decided that the benefits of green energy collected from wind turbines outweighs the slight loss in bird populations in the U.S. We have come to this conclusion for a couple of reasons first being the current wind turbines are altered in order further reduce bird mortality rates, by changing the color of the turbines along with added lights that are visible to the birds and loud noises associated with the wind turbines to all act together as a warning system to reduce bird fatalities. next , the implementation of these wind turbines have the ability to reduce the use of fossil fuel burning power plants therefore decreasing the pollution which is actually responsible for far greater displacement and death of birds . By lowering pollution levels in the environment, the overall health of the wildlife including birds will increase and the mortality rates caused by polluted habitats, air and food sources will decrease at a more substantial rate than the death rates caused by the wind turbines. Larsen, J. K., & Clausen, P.. (2002). Potential Wind Park Impacts on Whooper Swans in Winter: The Risk of Collision. Waterbirds: The International Journal of Waterbird Biology 25(1), 327–330. Loss, S. R., Will, T., & Marra, P. P. (2015). Direct mortality of birds from anthropogenic causes. Annu. Rev. Ecol. Evol. Syst. Annual Review of Ecology, Evolution, and Systematics, 46(1), 99-120. Retrieved February 28, 2016. It’s great to have the opportunity to read a great report on topics that you are frequently interested in. I can look forward to your possible updates. It is actually excellent to get the chance to read a fantastic high-quality report with beneficial info on subjects that loads are interested on.I concur together with your conclusions and can eagerly look forward for your potential updates.